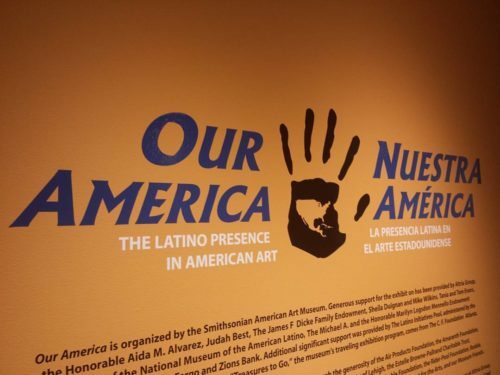 Stratoz and I went to the fine exhibit Our America: The Latino Presence in American Art at the Allentown Art Museum(through 10/02/16). 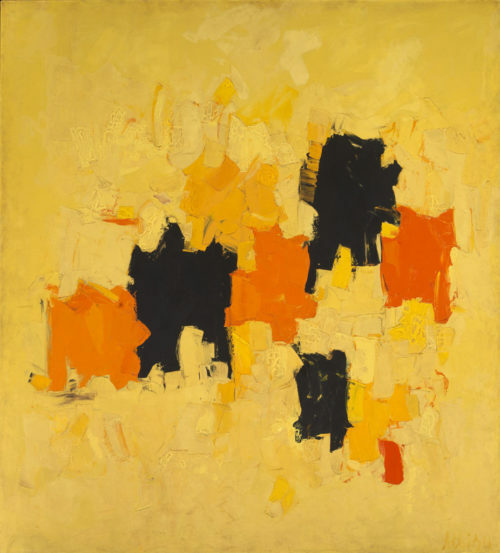 Walking into the gallery, my eye immediately went to this painting, Radiante, by Abstract Expressionist artist Olga Albizu(1924-2005). It looked familiar, and reading the tag, I discovered that her paintings are on several jazz album covers from RCA and Verve Records, including one of our favorites, Getz/Gilberto with Jobim(1964). This made Bossa Nova known in the US, and featured Stan Getz, American Saxophonist, collaborating with Brazilian Guitarist João Gilberto, and composer Antônio Carlos Jobim. Astrud Gilberto sang the now famous The Girl from Ipanema. I enjoyed how the music I love paired with art filled with abstract color energy. Olga Albizu studied art with Esteban Vicente in Puerto Rico, and then won a fellowship to study in New York in 1948. She was a student of Abstract Expressionist Hans Hoffman. I wanted to know how Albizu’s work came to be on album covers, and finally found some auction notes through Christie’s, written by Abby McEwen, Assistant Professor, University of Maryland, College Park. Albizu’s associations with RCA were also of a practical kind: she supported herself from time to time through secretarial jobs there, and through a remarkable connection – an assistant to the head of the record division, who displayed her work in the office – at least ten of her paintings were chosen for contemporary album covers. Albizu’s financial and professional struggles as a woman artist were, unsurprisingly, of a piece with her time; like peers from Carmen Herrera to Joan Mitchell and Elaine de Kooning, she lacked institutional support and regular exhibition opportunities. I am fascinated with how many internet articles mentioned that her paintings were on album covers and how buried the actual practical connection was. The confluence of people and ideas can be vivid when we are the midst of it, and become obscure as years go on. American jazz, Brazilian rhythms, Abstract Expressionism, and Puerto Rican artists, all converging in New York City. Exhibit at The Allentown Art Museum through 10/2/16. Photo by Wayne Stratz.